To be recognised for innovation, value, transparency, social benefits, competition, and reliability means a great deal to all of us at Google. Our business is innovation -- we all consider ourselves innovators and our approach is to focus on the user, to bet on the web and to keep it open. The great thing about innovation is that it has no bounds -- it's geographically blind. We’ve made the most of that here in Australia with small teams of dedicated engineers working on big projects such as Google Maps, Apps and Wave. We try to develop products for the future - not just the way people use the web right now, but the way they'll use it in five and ten years. Thank you to Choice for the award! Next year, I promise to wear a suit. 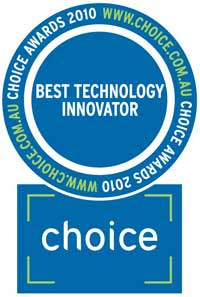 Last night I attended the inaugural CHOICE Awards and was honoured to accept on behalf of Google the award for 2010 CHOICE Best Techology Innovator.